A few months ago I celebrated Day of the Dead in Guanajuato. I visited with my husband as well as my in-laws and we had a wonderful time. Part of the reason I enjoyed my stay so much was due to the hotel that we stayed at. La Abadia Tradicional is absolutely gorgeous. It really is a wonderful option of where to stay in Guanajuato. Here’s why I loved it so much. This is NOT a sponsored post and I was NOT paid to write this post. However, I am an affiliate for a hotel booking website, so if you end up booking a stay at this hotel using one of my links, I will receive a small commission at no extra cost to you. You can read more about my affiliates on my Affiliates Page. Even the floors on the way to the pool are beautiful. I absolutely loved how the majority of the rooms are situated all around the lobby, rising up to four floors high. The warm orange colors also reflected how colorful Guanajuato is as a city itself. I loved how warm I felt coming into the welcoming lobby with it’s rich colors. The greenery of the plants hanging off all the balconies really added to Hotel Abadia’s charm as well. Our room was absolutely perfect. The bed was huge and very comfortable. We had a nice bathroom in our room, along with lots of shelves, a large TV and a safe. We also had a tall window overlooking the street outside, which was quite lovely as well, as I love opening the curtains in the morning and waking up with the sunlight. I really enjoyed the striped pattern on the quilt and the wooden accents around the room, such as the headboard, shelves and ceiling beams. Following my mother in law as we walk to the hotel pool. I just love the colors at Hotel Abadia! Since we visited in November, it was a bit too cold for us to use the pool. However, I did go for a walk to the pool with my mother in law and was blown away. The walk to get to the pool takes you along a beautiful cobblestone path full of beautiful plants. It felt almost like we were walking through a hidden jungle to get to the water. The orange and blue colors of the building set behind the greenery of the plants was breathtaking. I really like that Hotel Abadia has an outdoor pool and I hope that I can go back there in the summer and get some good use out of it. 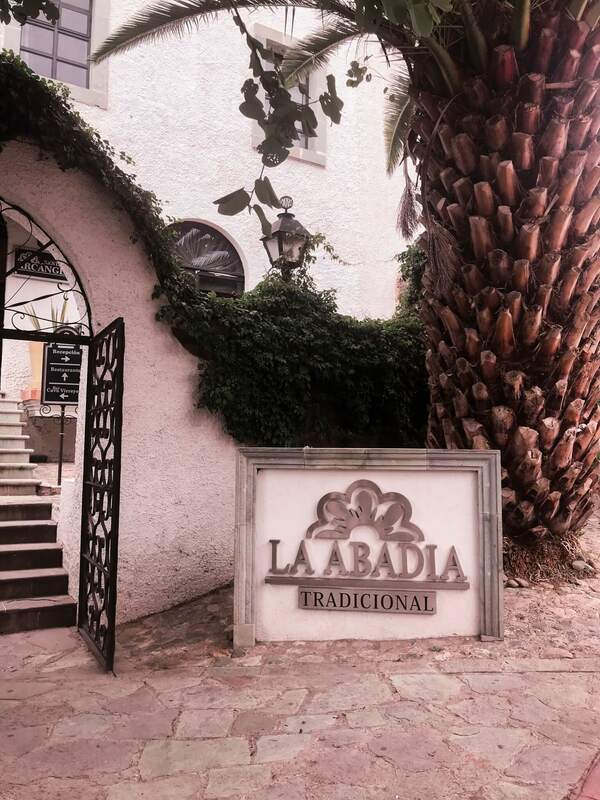 Hotel Abadia Tradicional is in an excellent location as well. While there is a lovely restaurant right in the hotel, it’s also just a short walk away from El Jardín de los Milagros, which means ‘The Garden of Miracles’. It’s a stunning restaurant with indoor and outdoor seating in a beautifully lush garden. The Hotel is also just a short 13 minute drive (or 25 minute walk) from the Guanajuato City Center. It’s nice because it’s far away enough that evenings are quiet, but close enough that you can get there quick and easily. While you’re in Guanajuato City be sure to go on a walking night tour of the city’s famous alleyways. You can book one of these tours with one of the many men selling tickets in the streets. These men will be wearing costumes from the Middle Ages. From the waiters in the hotel restaurant, to the cleaners, to the concierge, everyone at the hotel was extremely friendly. It really seemed like the staff enjoyed their work, and they were very helpful as well. If it weren’t for the concierge, we wouldn’t have found out about the restaurant listed above. Planning a Trip to Mexico? Get the Best Deals Below!